My current facebook newsfeed is inundated with videos of people executing in various ways the ALS ice bucket challenge. Before I start, I have to make clear my stance: I support the ALS awareness campaign. I support all types of disease-related awareness campaign wholeheartedly. I genuinely think that this campaign is an effective way of raising fund to support the research into battling this lethal disease. However, I can't help but to also feel that the movement is beginning to skew from its original intent of raising awareness of the disease to raising awareness of one’s own altruism and/or attractiveness in a wet T-shirt. The ALS awareness campaign started out like this: when somebody issues a challenge to you, you have to donate $100 to the ALS association, or you drench yourself in icy water. The purpose of soaking yourself is not to simulate what it feels like to have ALS, as some people have claimed. According to the ALS website, you should explain in the video the reason you are doing it–-to raise awareness and money to support the fight against ALS--and that's the whole point of doing the video. This campaign is all about raising awareness. Donation comes later; it's the awareness that matters--I'm sure we can all agree on that, because it's the same with every other donation campaigns. And if you beg to differ, perhaps you can tell me when was the last time someone came to you asking for money without making you aware of why he needed that money? Make no mistake, I applaud the people who actually described and talked about ALS in their videos, or explained it in the description of their videos. It's evident that they really read and researched about ALS before dumping that bucket of icy water over their head *check the awareness box*. Some, though, were downright disappointing. "Thanks for the challenge from John Door. And now I would like to nominate John Doe, Jane Doe and Baby Doe for this challenge. You have 24 hours guys. Click on this link: www.als.org to donate to ALS." Does the above statement look familiar to you? I guess most people jumped on the bandwagon with the sole aim of seeking attention. Let's imagine this scenario: if this campaign did not come with that ice bucket challenge, would everyone be so eager to participate at all? Looking at the painfully ineffective campaigns launched in the past by WWF, PTF Malaysia and other NGOs, I guess the answer is a solid no. In fact, a video made by PTF Malaysia to raise awareness and to change HIV stereotype has only 732 views as of 26th August 2014--it features 42 local celebrities in it and has been on youtube for more than three years. Compare this to an ALS ice bucket video, made by a small-time film maker, which has garnered more than 125000 views since published four days ago (20 August 2014). The popularity of this movement stems from the fact that it has a secondary mechanism i.e. the ice dumping video that acts as an appraisal tool that preys on the narcissist nature of modern humans. Looking it from another perspective, it's like someone telling you: hey by donating to us, you win yourself a ticket to make a video of yourself completing a funny challenge, which you may use to impress your friends. A person can always do a random video of himself dumping ice or wine over his head. But without a legit cause he could end up being dubbed an attention freak which, to some people, may be perceived as derogatory or an embarrassment. And this movement, with its colourful and creative way of soaking oneself with icy water, gives the person an opportunity (or an excuse, depending whether you see it in a positive or negative light) to acquire attention without worrying being called a narcissist. However, ALS patients and the disease itself should be the focal point of this campaign. Through this campaign, ALS patients want people to take a good look at them and to support them. 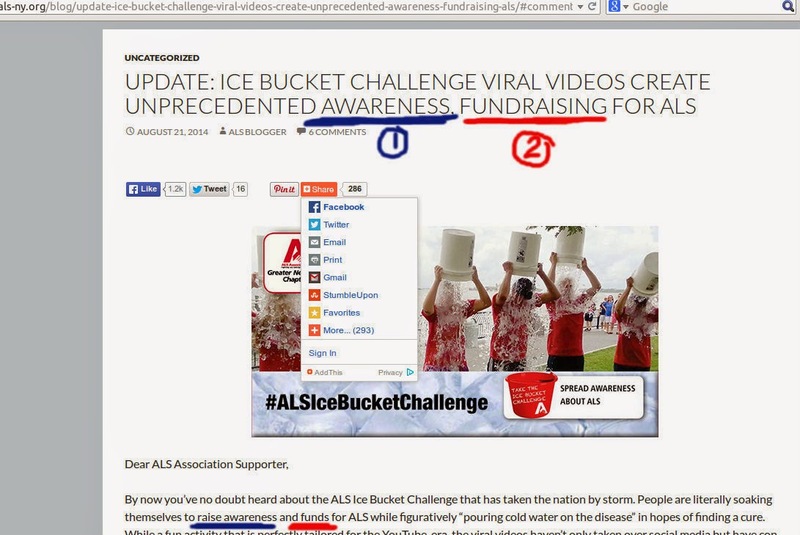 But the ice dumping videos are robbing from these ALS patients and organization the attention they deserve. Is that even fair? Okay, maybe a little bit of attention is fine. But adding in a short description or talk a little bit about the disease in the video would make it so much better, no? For most people though, attention comes first, donation is secondary, and when it comes to donation, let's face it: this ice bucket challenge has been a hugely successful money-raising campaign, and I'm not denying that the money is important for the people at the ALS association. According to the ALS.org website, the ALS Association’s national office and its 38 chapters have received, as of 25th August 2014, a combined $79.7 million in donations compared to $2.5 million during the same time period last year (July 29 to August 25). With this success they now have sufficient funds to fuel their research and to improve the lives of ALS patients. Let's not get into the only 7.71% of money being channelled into research on ALS right now. Send me a message and we'll talk about it in private. But how about awareness? I personally think that the awareness aspect is even more important because money will come in automatically once the public knows about the disease and the financial support needed to tackle it. But it takes forever and a tremendous amount of effort to properly educate the public. ALS is also know as the L__ G______ or m__________ disease. If you could answer that, congratulations! And if you couldn't, well, you're one of the reasons why I have been quite disappointed with this whole ice bucket stunt; most of the people who have done the challenge didn't bother to read about ALS--they didn't even bother to copy and paste even a tiny bit of info from the website. They put their emphasis on the challenge, not the awareness about the disease--because if they did, they would've known that one of the most famous scientists in the world, Professor Stephen Hawking, has been sitting in his wheelchair for more than 50 years thanks to ALS. The life expectancy of most ALS patients averages about two to five years from the time of diagnosis. 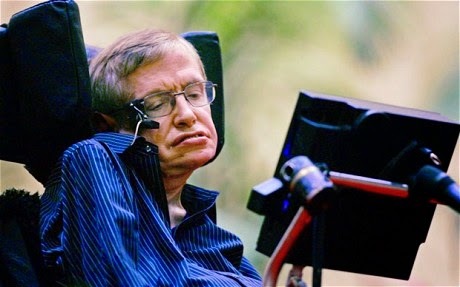 But unlike many other patients, Professor Hawking dramatically outlived the expectations of doctors who diagnosed him with ALS at the age of 21. And nobody, absolutely NOBODY, mentioned about this amazing physicist whose best-seller A Brief History of Time was on the London Sunday Times best-seller list for more than four years, and whose images are ubiquitous I'm sure people from all walks of life have seen his pictures at some point in their lives. And that effectively renders this entire campaign, in terms of raising awareness, a failure. 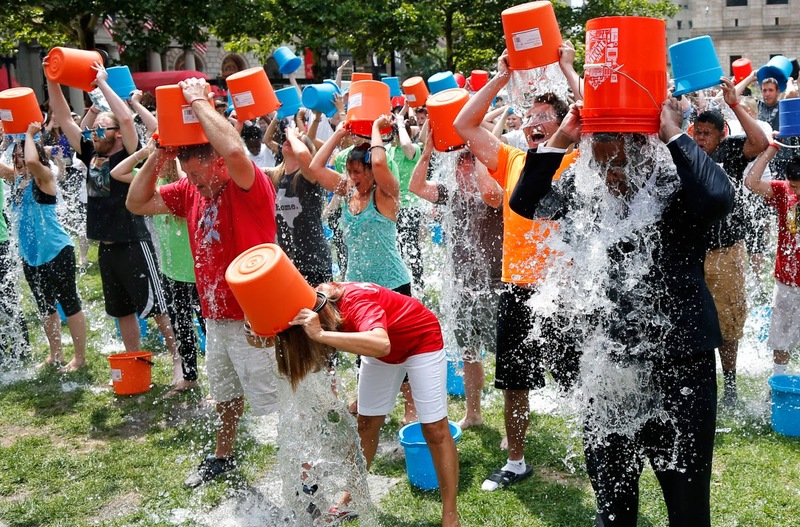 Some people argue that the ice bucket challenge is a massive waste of water. I do not agree. Unlike fossil fuel, water is a renewable resource. You take some water away from the tank and the rain refills the tank the next day(if it rains at all, that is). You waste something only because it is limited, something like the fossil fuel. Water, like sunlight, is unlimited. Besides, some opponents argue that we shouldn't waste water because there are people in other parts of the world who do not have access to clean water. Again, I do not agree. Wherever there are people, there will be water--proximity to water source is how the human civilization started in the first place. The cleanliness of water, however, is another issue altogether. Access to clean water can be easily manageable by local authorities. If for instance, Congo has no clean water; it's up to the Congolese government to do something to purify the water source. The action of an American conserving clean water in New York won't help the average Congolese to get clean water. Apart from that, some also argue that people living in places facing severe water shortage shouldn't participate in the challenge. Now this, I agree. 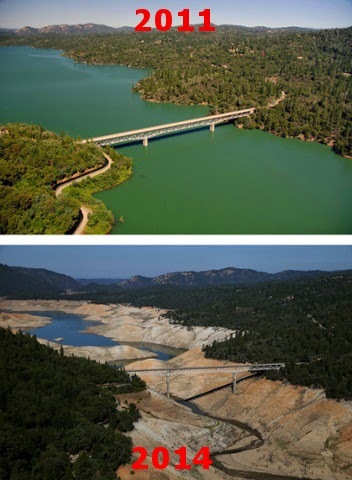 California is currently experiencing one the worst droughts on record. The Henan province in China is in a similar dire state. 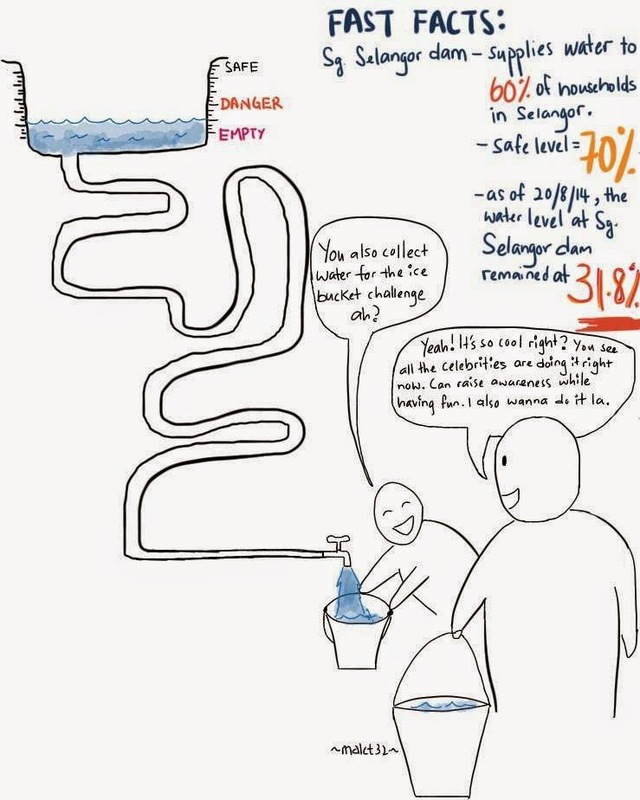 The state of Selangor is also facing severe water scarcity--in fact if it wasn't because of the severe water crisis in Selangor I would've dumped icy water all over myself as well; but I'd definitely have done it the right way. So in this case, water has become a limited resource, and hence I strongly believe that the residents in these places should suppress their narcissism the best they can to avoid wasting water. Let me reiterate my stance: I think that this ALS awareness campaign is a great idea to raise awareness and money to combat the lethal Lou Gehrig's disease. But it has evolved from the innocuous donate-or-splash campaign to the hey-look-at-me-look-look-LOOKKK movement that hurts my eyes and my head. This is really very well-written! An article aimed to raise awareness on raising awareness.